Integrated manufacturer in surface treatment technology!! YUKEN America manufactures and distributes a wide range of surface treatment chemicals, such as plating brighteners, passivation agents, corrosion-resistant coating products, and surface treatment agents for electronics parts, in addition to conventional cleaners and pretreatment products. YUKEN develops environmentally friendly products using its unique technology!! YUKEN is committed to the development of surface treatment technologies to maintain a green environment with “more environmentally-friendly” and “more user-friendly” as product concepts. Our CO2 -reduced products and services provided to our customers have contributed to establishing a low carbon emissions society. Quality management and technical support to ensure quality production!! The YUKEN Group is dedicated to providing top-tier customer services, working collaboratively to provide quality management and technical support. The quality of these services has been refined and recognized by major Japanese automobile and electronics OEMs after working closely for more than half a century. YUKEN as an active player worldwide is a specialist in surface treatment for materials like metals and non-ferrous metals. 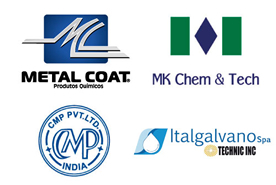 We support various industries worldwide by utilizing our surface treatment technology with “more environmentally friendly” and “more user-friendly” as products’ concepts.